Diabetic eye disease is a group of eye problems that patients may develop as a complication of diabetes. All can cause severe vision loss or even blindness. Diabetic retinopathy is a leading cause of blindness in American adults. It is caused by damage to retinal blood vessels. Cataract—clouding of the lens of the eye. Cataracts occur more frequently and at an earlier age in diabetic patients. Glaucoma — Optic nerve damage and vision loss that is often associated with elevated eye pressure. Diabetics have a higher risk of developing glaucoma. 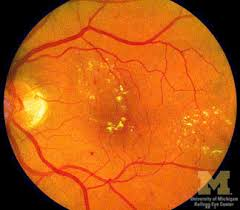 In some people with diabetic retinopathy, blood vessels leak fluid and cause swelling in the retina. In other people, abnormal new blood vessels grow on the surface of the retina. The retina is the light-sensitive tissue at the back of the eye. A healthy retina is necessary for good vision. Mild diabetic retinopathy can exist without producing any changes in vision. However the retinal damage can progress and cause vision loss. If the retinopathy is not treated, irreversible blindess can result. People of any age with type 1 or type 2 diabetes are at risk. It is very important for diabetic patients to get a comprehensive dilated eye exam by an ophthalmologist at least once a year. The longer you have diabetes, it becomes more likely diabetic retinopathy will develop. Between 40 to 45 percent of Americans with diabetes have some stage of diabetic retinopathy. If you have diabetic retinopathy, timely treatment can help prevent its progression. Diabetes can sometimes develop during pregnancy in women who did not have it previously. All pregnant woman with diabetes should have a comprehensive dilated eye exam as soon as possible. Your ophthalmologist may recommend additional exams during your pregnancy. If you have diabetes get a comprehensive dilated eye exam by a board certified ophthalmologist at least once a year. Do not wait until symptoms develop to have your eyes examined. When vision is damaged by diabetic eye disease, it is not always possible to return it to normal. Keeping your blood sugar and blood pressure under control reduces the risk of developing diabetic retinopathy. Speak to your primary care physician to help manage this. As a board certified ophthalmologist, Dr. Mary looks for diabetic retinopathy at its earliest stages. We also have state of the art ophthalmic equipment to perform a variety of retinal studies, including retinal photography, and OCT scanning. These tests can help determine when retinal laser treatment is appropriate to preserve vision.